Welcome to our Holiday Blog Hop and giveaway with our friends at Stampendous! Both design teams are bringing spooky fun or holiday cheer into our projects during the week. Learn tips and techniques and be inspired! Today Linsey Rickett and Margie Higuchi will start us off with their festive card creations. 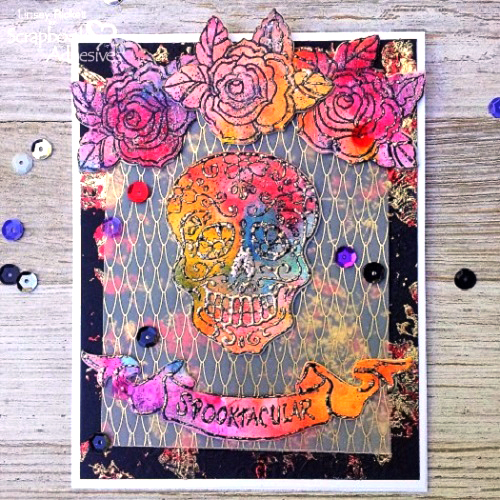 This mixed media card came together easily with the Stampendous Sugar Skull Cling Stamps and Dies Set and Aperture 5-Jar Kit Embossing Powder. With the help of Adhesive Sheets 4 x 6 inch, it turned out to be a super cool effect! Create a Wear Your Adhesive on the Outside background with Craft Foils from 3D Foam Creative Embellishment Kit and Adhesive Sheets 4 x6 inch. Randomly apply an Adhesive Sheet to dry embossed black cardstock (no need to cover entirely). Then randomly apply red and gold craft foils. Add a piece of water-colored cardstock on to a 3D Foam Creative Sheet from the 3D Foam Creative Embellishment Kit. With the Sugar Skull Cling Stamps and Dies Set, die-cut skull, roses and banner. Stamp coordinating images to each die cut with black Versamark ink, sprinkle with Marcasite glitter embossing powder from the Aperture 5-Jar Kit Embossing Powder. Melt with a heating tool. Add the dimensional die cuts to the vellum card panel. Assemble the card using E-Z Runner® Permanent Strips Refillable Dispenser and finish with sequins added using Adhesive Dots Medium. I love the little red pick up truck and knew exactly what I wanted to do with the Christmas tree! Do you spy 3D Foam Circles as ornaments? Using Foils from the 3D Foam Holiday Embellishment Kit, I placed 3D Foam Circles Small Size on top of the ornament design, took off the top liner and applied the different foil colors for a dimensional element to the card. This concept is called “Wear Your Adhesive On The Outside” and I love the effect! Who still has those decorative edge scissors? I used a pair for my hilly ground – LOL! Want to see more? I have a step-by-step tutorial on my blog. CLICK: Scrapbook Adhesives by 3L + Stampendous Blog Hop: Loads of Christmas Wishes Card post to visit. Don’t miss out on our other Blog Hop Days! For Day 2: CLICK: Holiday Cheer with Stampendous – Day 2. Looking for Day 3? CLICK: Joyful Inspiration from Stampendous – Day 3. Here’s Day 5, CLICK: Holiday Fun with Stampendous – Day 5. If you cannot see the comment section (at the bottom of this post), please CLICK: Holiday Card Creations with Stampendous! – Day 1 and scroll down to the bottom of the post. This entry was posted in 3D Foam Circles, 3D Foam Creative Sheets, 3D Foam Squares, Adhesive Dots & Lines, Adhesive Sheets, Adhesives, Announcement, Cards, Crafts & Tutorials, E-Z Runner® Dispensers, Embellishments, Fall, Intermediate, Metallic Transfer Foil, Mixed Media, Permanent Adhesive, Seasonal Craft Ideas, Skill Level, Wear your Adhesive on the Outside, Winter and tagged 3D Foam Circles White Mix, 3D Foam Creative Embellishment Kit with Foil, 3D Foam Holiday Embellishment Kit with Foil, 3D Foam Squares Mix White, 3D Foam Squares Regular White, 3D Foam Squares Small White, Adhesive Dots Medium, Adhesive Sheets 4x6", Blog Hop, Card, Card Making, Christmas, Christmas Tree, Craft Foil, Die-Cutting, E-Z Runner Permanent Strips, E-Z Runner Permanent Strips Refill, E-Z Runner Permanent Strips Refillable, E-Z Runner Permanent Strips Refillable Value Pack, Foil, Giveaway, Halloween, Holiday, Linsey Rickett, Margie Higuchi, Metallic Transfer Foil Holographic, Metallic Transfer Foil Variety, Mixed Media, Stampendous, Wear Your Adhesive on the Outside. Bookmark the permalink. 66 Responses to "Holiday Card Creations with Stampendous! – Day 1"
I love the cool background effect Linsey got on her card with the adhesive sheets & foil. It’s such a pretty look and the color possibilities are endless. Both cards are awesome and fun. Spooktakular colors on the first one and love the technique to make the ornaments on the cute truck card. Such creative cards! Love this match up! I love the background on the first and the tree on the second! Such great cards! These cards are great – thank you for sharing! I love the old truck, so many possibilities for It! Love the tree in this one! Lindsey’s card is awesome – great colours and imagery, I know my daughter would love this! And truck and tree card is equally awesome! The foam popping ornaments is a super idea! Great projects. I really like the idea of using the foam circles with the foil. Brilliant for ornaments. I really liked the way you used the foam dots & foil ! What an exciting way to get pumped up for the holidays! Love these Mixed Media projects! Spooky mixed media page, so awesome. I have the truck stamp set and I love it. Great card. I love Margiexs card. That little red truck is so cute! With my last name, I am of course drawn to the sugar skull card!!! 🙂 Love the wonderful techniques used to create the fun effects! It looks fabulous! The truck with the Christmas tree card is cute, too! I never thought of decorating the foam pieces! Nice idea. Sparkly Cards. Thank you for sharing. Love the use of 3D foam circles as Christmas tree ornaments! Very cute! Love the mixed media look of the card!!! Always fun to see new techniques and.various approaches to tools. I love thesugar skulls. The roses and the banner are a great touch. 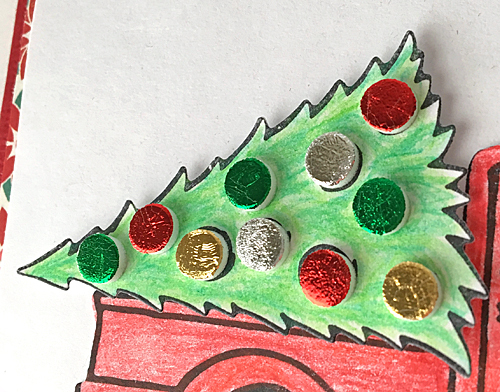 I loved the use of foil on the pop dots to make the Christmas tree decorations. Wonderful projects. I love the Skull card! The Halloween card is super cool!!!!!! I love foiling, all my cards lately have foil on them. I really like the foiling technique on Linsey’s card! It’s GREAT product for those of us that don’t own a laminate machine. Margie’s card is SO cute! I love the simplicity of using 3D foam dots w/ glitter as tree decorations. It’s most definitely something that I would replicate. Cool cards, foam circles with glitter are really a nice way to use the foam, thank you for the great ideas. What darling cards! I love the tree in the truck! So creative to use the foam circles as ornaments! Both cards are just awesome! THe background effect on the skull one is just stampendous! I love the old fashion look of the truck card . Reminds me of my grandfathers old truck and us going Christmas tree hunting in it every year! Ahhh such fond memories! Thank you for sharing! Fantastic cards and techniques. Love the images and shine from the foil. I definitely like cute animal stamps and I like shadow box techniques for scenes. Hi, I love both cards! My favorite technique is the use of the adhesive on the outside. The Christmas tree ornaments are fabulous! Love the christmas tree and yes, I have my deckle scissors. Love the background on the Sugar Skull card! So much awesome texture! Awesome 3D foam circle ornaments too! I enjoyed both your projects! Thanks for sharing them today! I just love the holiday card with the red truck. It’s so cute and a classic to me. Decorating the foam circles? Wow! 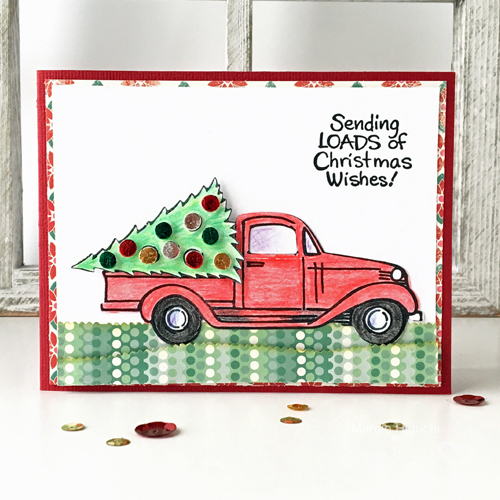 Love the tree in the red pickup truck card because it screams Christmas! 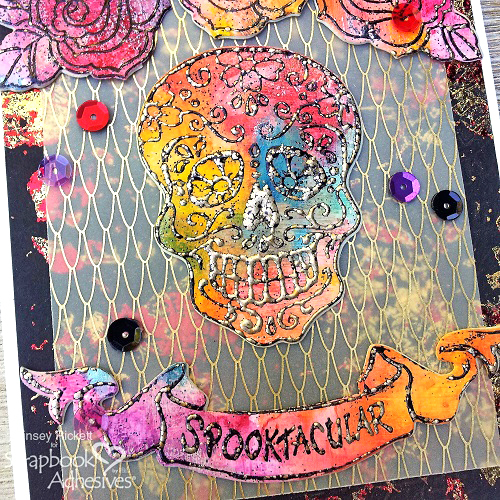 very unique background for the sugar skull… must try! out and ready for the Halloween season. The wonderful Sugar Skull Cling Stamps And Dies Set is the greatest. Thanks for sharing. who knew foam circles would look so cute!? Love the red truck and Christmas tree, caught my eye ! Love how both projects show and highlight many ways to use Scrapbook Adhesives. Such awesome ideas here on the blog!!! Fabulous cards! 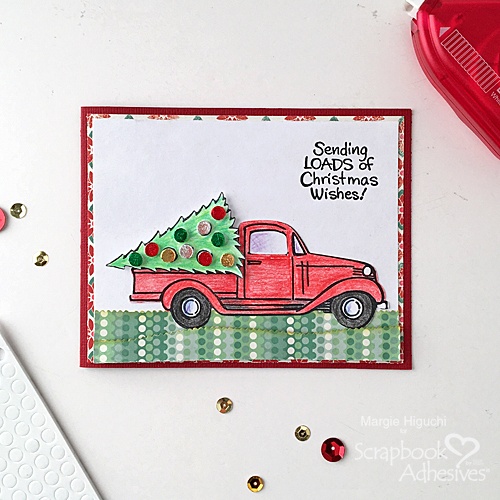 Love the red truck — it is my favorite design both nostalgic and so doggone cute! Great cards, perfect for Christmas. Fantastic ideas. Love the truck with the tree. Such a cute and fun post! Darling cards!!! Great projects and card! Thanks for the inspiration!!! Wow the background is awesome. Using the foam circles covered with foils is so creative and a great use of an item we all have in our stash. Thanks for the inspiration with these projects.